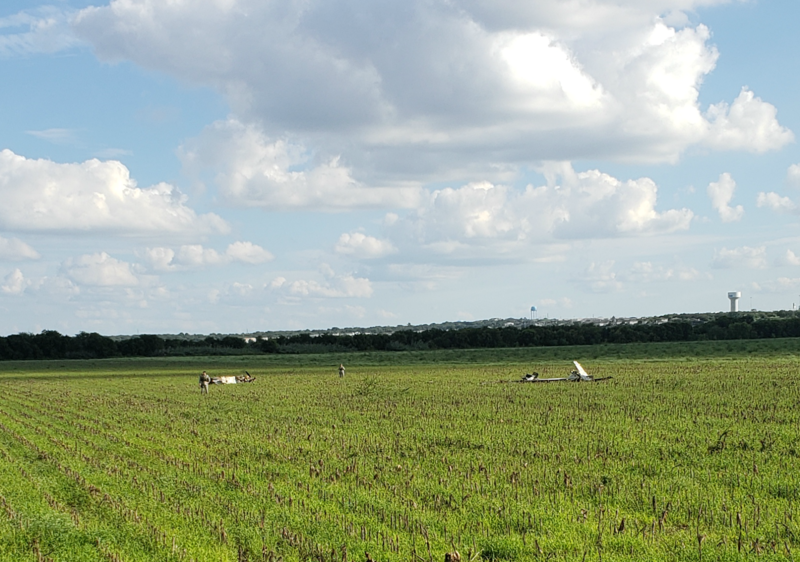 An Air Force plane has crashed Tuesday in a field off Nacogdoches Road, north of Loop 1604. “It appears the aircraft experienced engine failure on final approach at low altitude, configured for landing before our Airmen ejected,” said Col. Mark S. Robinson, 12th FTW commander. “The interim safety board will be looking at all aspects of the aircraft, to include the engine components, to determine the cause of the crash,” Robinson said. The plane crashed near Rolling Oaks Mall, at around 4 p.m. The extent of the damaged property has not been assessed, he said. Fire and safety personnel from JBSA, the 12th Flying Training Wing and some local communities responded to the incident. The T-6 Texan is a trainer aircraft that has had issues where dozens of pilots became disoriented due to malfunctions in the aircraft’s oxygen system. Last week, Air Force Lt. Gen. Steven Kwast, head of AETC, announced the malfunctions were caused by fluctuating concentrations of oxygen in the cockpit, and that the issue had been resolved. The 12th FTW said in an earlier news release Wednesday it has suspended training using the T-6A Texan II aircraft at JBSA-Randolph. “We are grateful to the community and the first responders who rushed to help our airmen at the site of the crash,” said Col. Mark Robinson, 12th Flying Training Wing commander. “While we can’t rule out any specific cause, initial indications do not give us reason to believe that the On-Board Oxygen Generation System is a factor in today’s accident." NOTE: This story was updated with news that the 12th Flying Training Wing has suspended training with the T-6A Texan II plane at JBSA-Randolph. ... This story was updated later in the day with news of engine failure as the cause of the crash.